What is an annotated bibliography and how do I write one? - Ask Us! Q. What is an annotated bibliography and how do I write one? An annotated bibliography is a list of books, articles, Websites, and other sources that you have discovered and used while researching your topic. Information about each source (author, title, date, etc.) is cited according to a designated format from your instructor such as APA or MLA. 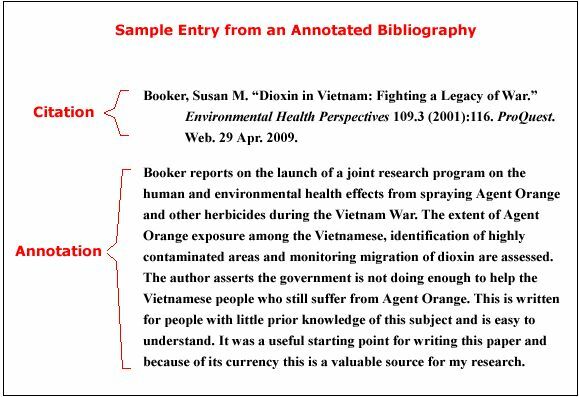 What makes an annotated bibliography different from just a list of citations? After each citation you will write a short summary, description, analysis and/ or evaluation of the cited article, book, etc. Your Instructor will provide specific guidelines for writing your annotations. Please remember that copying and pasting a summary from an abstract is NOT acceptable. This is considered plagiarism. Links to examples by style guide.